In Kazakhstan, in January-June of 2018, 38.527 mln tons of crude oil and 6.629 mln tons of gas condensate were produced, which, respectively, by 7.6% and 0.9% less in comparison with January-June of 2017, the statistics Committee of the Ministry of Economy reported. In the reporting period, 12.06 bln cubic meters of natural gas in the gaseous state were produced in the country (4.5% more). Production of associated petroleum gas in the reporting period amounted to 16.457 bln cubic meters (11.7% more). The national company KazMunayGaswill not sell a stake in a Romanian subsidiary company –KazMunaiGas International (KMGI) toChinese company CEFC China Energy Company Limited, said in a statement on the website of the Bucharest stock exchange. "KMGI reports that the deal for acquisition of 51% stake in KMG International N. V. by China Energy Company Limited will not be completed," –stated in the message. The decision on whether there will be a deal, had to be made before June 30, 2018. "The parties will not prolong this period," thereport states. The decision on cancellation of the deal will not affect the activities of KMG International N. V. and its subsidiaries, "they continue to have the full support of their parent national company KazMunayGas, the report says. KMGI (formerly Rompetrol holding) was acquired by KMG in 2007. The company owns two refineries in Romania, a network of petrol stations in the EU. In December of 2016, KMG and CEFC China Energy Company has signed a package of agreements on creation of a joint venture on the basis of KMGI, with equity ratio of 49% to 51% respectively. In the framework of agreements CEFC assumed a number of obligations under which it had to invest and develop projects in the field of oil refining and development of networks of petrol stations together with KMG. As reported by some media, China's CEFC is currently in the process of bankruptcy. CEFC also was going to buy 14,16% of Rosneft for $9.1 bln. But in the end the deal for the purchase of shares was canceled due to financial problems of CEFC. They began in late 2017, when the US banks revoked a previously issued line of credit. The National Welfare Fund Samruk-Kazyna JSC has prematurely repaid the syndicated loan of $1.5 bln raised in 2015 for the purchase of a 50% stake in the private limited liability company KMG Kashagan BV, reports the Department of public relations of the Fund. For repayment of the loan, the Fund has attracted $900 mln of its own funds and $600 mln of a new loan obtained from a syndicate of international and local banks: Bank of Tokyo Mitsubishi UFJ, Mizuho Bank Ltd, Sumitomo Mitsui Banking Corporation, Halyk Savings Bank of Kazakhstan JSC, Industrial & Commercial Bank of China (Almaty) JSC and Citibank Kazakhstan JSC. Thus, Samruk-Kazyna has kept presence on the international market of debt capital, reduced external debt by $900 mln and has significantly reduced the cost of loan, noted in the Fund. July 4, Intergas Central Asia JSC, a member of the KazTransGas JSC group of companies, received the status of the national operator on the trunk gas pipeline. Under the current Law "On trunk pipeline", the competence to define the national operators by types of products, such as oil and gas, prepared for transportation through trunk pipelines is secured after the Government. "The main objectives of the new national operator is to ensure the interests of the state and other participants of relations in the transportation of commercial gas by trunk gas pipelines to the domestic and foreign markets. In addition, the company will provide innovative development of the system of trunk pipelines and its integration into the world energy system, thereby increasing the energy potential of the state through diversification of commercial gas flows," –noted in the press release KTG. Vitol oil trader intends to increase the amount of the deal with KMG for the prepaid oil supply from Kashagan, Reuters reports with reference to own sources. One of the sources said that the transaction value will amount to $650 mln. Three other source in the banking and oil sectors, said that the amount of the advance payment may reach $750 mln. They noted that the document will be signed soon, without naming a specific date. Thus, the total sum prepaid by Vitol amounts to roughly $2.25 bln, Reuters reports. Both participants of the potential deal declined to comment. In August of 2016, KMG Kashagan B. V. conducted a tender to select an international trader to arrange advance payments of oil, falling on the share of KMG Kashagan B. V. in the North-Caspian project for $1 bln. As the result of the tender Vitol was determined as the winner. In September of last year, the loan provided by various international banks has been increased by $600 mln. Kazakhstan holds 16.88% of the project through KMG Kashagan BV. On July 9, the President of Kazakhstan Nursultan Nazarbayev signed the Law "On amendments and additions to some legislative acts of the Republic of Kazakhstan on gas and gas supply", aimed at improving the legislation in the sphere of gas and gas supply. The amendments require the phased deregulation of wholesale prices for liquefied gas. 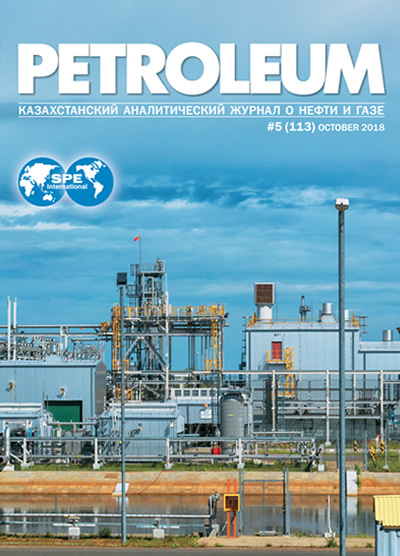 For that purpose a new mechanism for the supply of liquefied petroleum gas to the domestic market of Kazakhstan via electronic trading platforms (ETP) is introduced, starting January 1, 2019. In the Caspian sea port of Bautino(in Mangistau region) Otegen Batyr tug had arrived, the latest in a series of six tugs, built at the Dutch shipyards for Caspian Offshore Construction company. "The program of construction of six ASD tugs under the contract for the design and construction of six new multifunctionaltugs for further work in the CaTRo channel in the Prorva area at the Tengizchevroil Future Growth Project, concluded in June 2017 between Caspian Offshore Construction LLP and the Dutch shipyard De Hoop Lobith, successfully implemented in record time," –said in a statement. All 6 of the tugs, named in honor of the Kazakh batyrs, independently carried out ocean crossings from the port of Rotterdam to the port of Bautino. Each ship traveled more than 4 thousand nautical miles (7400 km). To date, all 6 ships were set to work. As noted in the company, Kabanbay Batyr, Karasay Batyr, Bogenbay Batyr and Nauryzbay Batyr vessels are designed for towing barges with modules through the artificial channel with length of about 70 km and a width of not more than 60 meters. Two more vessels –Raiymbek Batyr and Otegen Batyr –will act as tugs in the aquatic area of not more than 300 meters in diameter. KMG International(KMGI), a subsidiary of KazMunayGas, plans to buy out 26.7% of the shares of Rompetrol Rafinare S. A. from the government of Romania in 2018-2019, the press service of KMGI reported. KMG and the government of Romania signed a Memorandum in 2013, according to which KMGI has committed to purchase from the Romanian authorities of 26.7% of Rompetrol Rafinare shares for $200 mln and create the investment Fund with Charter capital of $150 mln and total assets of up to $1 bln. Currently, through KMGI, KMG owns 54,63% stake in Rompetrol Rafinare S. A. – operator of Petromidia refinery, Vega and petrochemical complex. The rest of 44,69% owned by the Romanian Government. KMGI noted that the completion of all activities is planned for 2018-2019. "Funding is is carried out by KMGI itself, – the press-service of the company quotes the top Manager of KMGI. Assylbek Dzhakiyevwas appointed the official representative of the National Chamber of Entrepreneurs Atameken on cooperation with Tengizchevroil LLP, North Caspian Operating Company (NCOC), Karachaganak Petroleum Operating (KPO) and development of oilfield services. Dzhakiyev was born in Atyrau on may 8, 1984. Graduated from KIMEP with a degree in the Social Sciences. He studied at the University of Trento (Italy), University of Regensburg (Germany), Corvinus University (Hungary), Geneva Institute of International Relations (Switzerland). Worked in Agip KCO, socio-entrepreneurial corporation Kaspiy, private business. From 2012 to 2013, he was the Director of Atyrau regional branch of Atameken National Economic Chamber of Kazakhstan. From 2013 to 2018, was the head of the Chamber of Entrepreneurs of Atyrau region. Assylbek Dzhakiyev is responsible for interaction with major oil and gas operators on issues of local content development, support for small and medium-sized businesses and the promotion of oilfield projects. The Board of Directorsof Mangistaumunaigas on July 27, 2018 decided to release Pei Jiansheng from the post of First Deputy General Director, and to appoint Liu Jincheng to this post. The body of the joint-stock company, taking into account changes made to it included: Bakyt Imanbaev, Liu Jincheng. Mangistaumunaigas is Kazakhstan oil and gas company. The company's headquarters is in Aktau. Mangistaumunaigas is one of the five largest oil and gas companies in Kazakhstan. North Caspian Operating Company, the operator of Kashagan, has begun construction of a temporary parking lot for hovercrafts at its base in the port of Bautino (Tupkaragan district, Mangystau region), the company said. "The construction of a temporary parking lot was developed on the territory of the base at Bautino, in connection with the planned use in the North Caspian project of a new type of maritime transport – the hovercraft. The temporary parking lot will be a small construction of precast concrete pavement slabs, with a ramp for ascent and descent of the hovercraft", – explained in the company. The hovercraft will be used to service the offshore complex (production facilities on artificial islands D, A, ЕРС2, ЕРС3, ЕРС4). To date, all permits are obtained and construction work commenced. The project completion date is October 2018. The hovercraft will be ordered from a specialized manufacturer. The project cost is not specified.